Windows Mobile 6.1 just got officially unveiled Tuesday at CTIA, including a list of devices slated to receive upgrades. Curiously, the Treo 750 was not on that list at all. I say curiously because the Treo 750 was 1 of 2 devices originally announced as definitely planned to offer full support for Mobile Device Manager, which requires Windows Mobile 6.1 on the device end. So much for product roadmaps, huh? 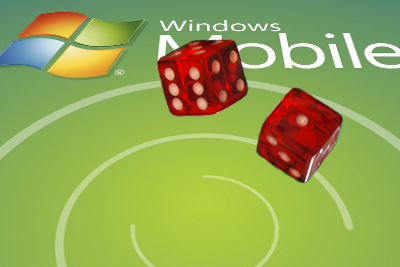 So yours truly decided to roll Windows Mobile 6.1 the hard way. That is, through non-official channels. Assuming you have a Windows XP box available to do the work, the whole process takes roughly 20–30 minutes. If you only have a Vista machine running WMDC, expect the process to finish, oh….NEVER! 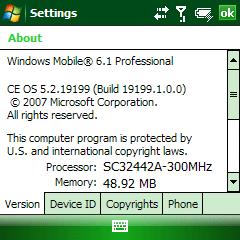 The process was smooth as pie, and now I’m rocking Windows Mobile 6.1 in full skull & crossbones fashion. Definitely faster than Windows Mobile 6, even with a non-vanilla installation. In fact, I’ll prolly re-flash the device and wipe the extended ROM, which is the location where all the crapware AT&T includes on their devices resides. Evidently, reclaiming the extended ROM should be good for another 9 MB of memory. The other benefit of rolling your own? Now, to be fair, my Treo had all of the above before, except for the Live Mobile suite, including Messenger. But that was a huge omission for me, since I use Messenger to keep in touch with a ton of folks while I’m on the go and have a bit of downtime. And yes, Tim’s right. Messenger’s quote line is the closest I’ll ever get to anything even remotely resembling Twitter. Ha! Why is it that the cooked ROMs run better than the official ones? I’ve found it handy to copy the extROM before wiping. Makes it easier to get to the custom apps if the cooked ROM you’re using turns out to be decent and you actually want to use it with your current carrier. Actually, I’m not an MVP in Mobility. Amazingly enough, my official MVP area of expertise is Small Business Server. Or so they tell me. And cooked ROMs rule because they don’t include all the crapware for which the mobile operators signed hellaciously lucrative bundling contracts to include on their millions of handsets. Really tho, it’s no different than the typical off-the-shelf PC, which runs hella better when it gets paved and re-installed with a vanilla install of its OS. @ Chris back at ya! I hear you on the crapware. I instantly reach for my install disks with any new PC. Congrats on the MVP renewal! I’m curious as to whick cooked version you used and what tool you would recommend for wiping the extended memory. There is so many different people offering cooked ROM its hard to know which one to go with. Sorry. That would cross a line I set re: the use of cooked ROMs. No recommends, no instrux from the Funcave on this subject. When it comes to bricking your handset, you are on your own.